All plumbing needs to properly be vented to work and at it’s finest. 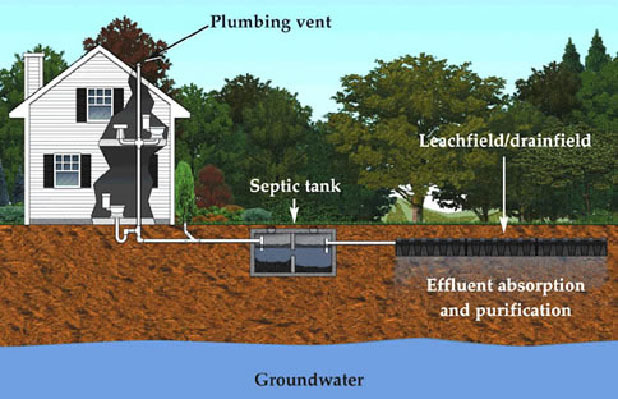 Sewer systems before city sewer was installed was on private septic tanks. The picture above shows you that it was basically a huge whole with a some kind of container to hold and contain all of the debris. Over time when pipes inside the septic tank fell or broke all plumbers did to repair the issue was feed a new pipe threw the septic system instead of removing septic tank itself. Septic tanks are very heavy and there’s no need to dispose of them. Next time you discover a back up in your basement call Hiawatha Plumbing. Weather there’s water on your basement floor or not so nice smelling stuff call Hiawatha Plumbing and will take care of you and get you draining again. Most houses have roots and need cleaning once a year.